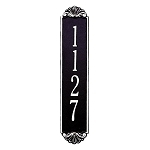 This vertical address plaque holds four 4.5" characters or eight 2" characters. 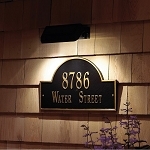 The address plaques is hand-crafted from rust-free recycled aluminum. Paints have been specially formulated and weather tested to withstand the harshest of elements. Made in USA. 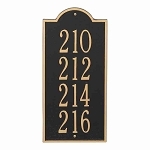 This vertical plaque is designed for mounting on a wall. Mounting hardware provided. - Line 1 holds up to four 4.5" characters or eight 2" characters. Very nice. Well made. We think it makes our entryway more attractive withy being overstated.